its way into our hearts and detonated there. Every year we lose too many citizens of what Forry Ackerman called the Imagi-Nation. Instead of the Scroll of Thoth where we can bring them back, we have the Scroll of Death for lost celebrities in science fiction, fantasy and horror. We are only so surprised when major figures who transformed our childhoods pass into the shadows. After all, we haven't been kids ourselves for a long time. The real shock is when someone exits through the creaking door before his time. Something deep inside the hidden vault of our dreams and fears won't accept the tomb when we weren't expecting it. Eric Caidin is not supposed to be among the dear departed. He should still be with us, a fixture in the Dealers Room of various conventions, a presence at special film showings, an iconic figure at wrestling shows. He should be holding court at Hollywood Book and Poster Company. Instead, he is the image we want to celebrate this Halloween at Mondo Cult. Jessie and I extend an invitation to those who care to contribute to this celebration of Eric Caidin. We would like to keep this invitation open until the New Year. We remember his store when it was a lighthouse on Hollywood Boulevard. "To Brad -- Hopefully in Aftermath 2 they'll spell my name right. Eric Caidin"
He wrote that in black on the back. Flipping it over to the front, there's his name with the usual misspelling of "Caiden." But FJA is listed as Forest (not Forrest) J. (not J without the period) Ackerman. They got the last name right, if they knew what was good for 'em! Anyway, looking at this disc I remembered when I first met the director and star of Aftermath, Steve Barkett. It was back when Fred Olen Ray had an office on Sunset, in easy walking distance of Buddy Barnett's Cinema Collectors on Wilcox, and Eric's store in Hollywood. Over the years, Fred pretty much introduced me to everyone. Thanks to him, I had a ticket right into the heart of Hollyweird (as Forry might say). Buddy and Eric made a strong impression. The most memorable conversation I ever had with Eric would be about Edward D. Wood, Jr.! We'd both appeared in Flying Saucers Over Hollywood: The Plan 9 Companion, the brainchild of Mark Carducci and Lee Harris. It was some time after that when Eric and I discussed the under-appreciated areas of Wood's competence. After all, you can see and hear his films just fine. Then Eric and I waded into the muddy waters of the Medved Problem. Hard to see anything clearly when you look down there. We agreed that Harry and Michael had brought so much new attention to Ed Wood that all the good things followed—including the Tim Burton film and Martin Landau winning the Oscar for his interpretation of Bela Lugosi. On the other hand, the Medveds opened the door to various horrors, including MST 3000. I confessed to Eric that I had been a CineCriminal myself by doing my own column in the spirit of The Golden Turkey Awards. It was called "Der Krapp," and was not my finest hour. I even admitted to a brief correspondence with Michael Medved. Fortunately, I was only so mean spirited to the oddball films I was attempting to skewer. Good qualities were impossible to ignore. I couldn't be a ruthless Medved, after all. It just wasn't In me. When I started writing for Cult Movies, a great weight was lifted from my shoulders. Eric Caidin was a Keeper of the Flame. He was one of those from whom I received a Papal Indulgence for past crimes. Many "bad movies" were not bad at all. His store was a shrine to Eccentric Cinema, old and new. Naturally this leads directly to Mexican wrestling horror movies from Azteca, and the wisdom of the Guru Johnny Legend. Eric was dedicated to this unique area where the macabre meets the muscular. He knew his subject. As a regular guest of DragonCon in Atlanta, Georgia (my old stomping ground) it was a Halloween Treat to see Weird Wrestling take up residence there. Naturally, Fred and Eric played significant roles in that spectacle. It was Destiny, and I was a witness to the glory. However wide his travels, Eric was a Homing Bat who always flapped his way home to Hollywood Book and Poster. The guys who worked at the store liked him. There is no better legacy. The real fans found each other at his store. When Jessie Lilley and I were planning Mondo Cult, we knew that certain things had to be included. We wanted participation from Buddy. We wanted participation from Eric. The idea of Mondo Cult was to create a refuge for readers of Worldly Remains and Cult Movies. Losing one of those titles was bad enough; but losing both was a catastrophe. Times changed. But memory remains. Eric always treated both magazines with the greatest respect. He displayed them proudly. But as said before, times change. Edward L. Plumb came up with the title of Mondo Cult, a logical coupling of both titles. Eric treated the brief occasions of the new magazine just as well at his store as the progenitor publications. Less logical is the foto of Eric in MC2. 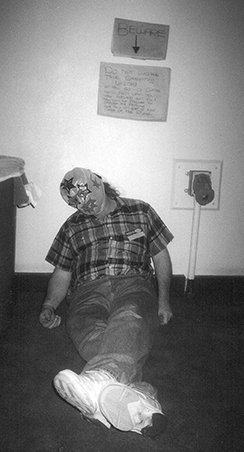 He's lying prostrate on the floor, wearing a wrestling mask worthy of a Santos movie. The caption reads "Dead Eric." How strange to read that now. I prefer the other photograph in Caidin’s Cocktail Hour. 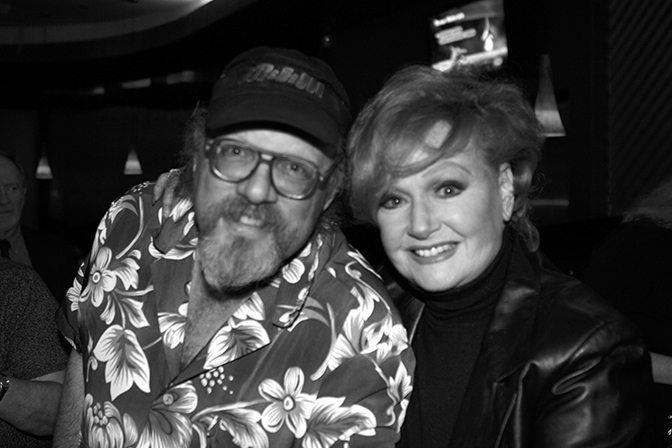 He's posing with the always exuberant Ann Robinson. The picture I like best of all is the masterful portrait by L. J. Dopp that honors this site. Our resident artist has captured the interests and essence of Mr. Caidin. Eric now joins another Erik as a phantom of Hollywood. He's somewhere special, in a place between light and darkness. There are monsters and wrestlers and beautiful women. As the mist clears, we recognize the post-apocalyptic landscape of the Aftermath. As we peer into the distance, we see Eric and his friends at the only Trading Post on the horizon. We can't wait to meet the proprietor, the man wearing the cap, the man with an infectious smile.